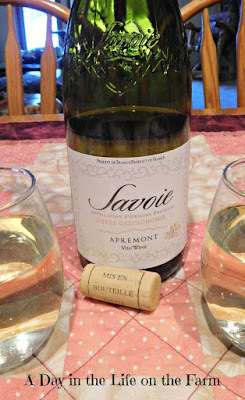 Since February is the month of Love, Lynn of Savor the Harvest arranged for our French Winophiles group to be gifted some samples of French wines that speak of L'Amour. She sums it up in her preview post. We each received 4 very nice bottles. I will be sharing my own thoughts, impressions and feelings about these wines in the posts that I write. I received no monetary compensation for this or any post featuring these wines. I have previously posted a pairing with the Cote-Rotie from Vidal Fleury when I paired it with a Perfect Baked Potato stuffed with Ropa Vieja. The wine I am sharing in today's post was enjoyed at an early Valentine's Day Dinner that Frank and I celebrated before we left for our California vacation. Knowing that we would be spending all day on Valentine's Day in airports and on planes, not to mention that we would also be observing Ash Wednesday, we spent the week before our trip having several quiet, romantic dinners at home. This particular dinner was my personal favorite. I cooked up a Shrimp Etouffee from a recipe I found in my Cuisine at Home magazine. 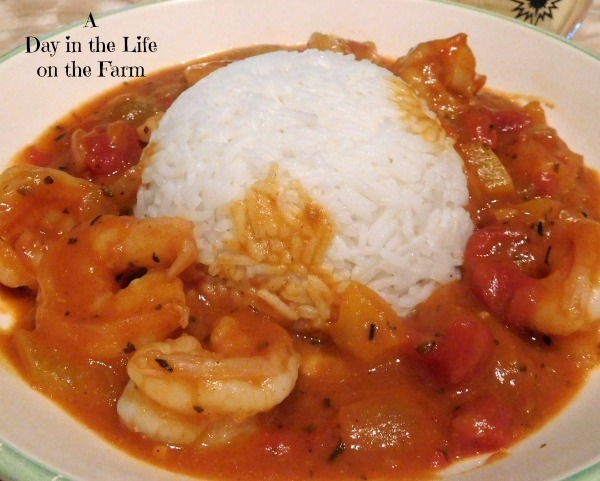 I had never made Shrimp Etouffee before but when my friend, Kathy of A Spoonful of Thyme, volunteered to host our Soup Swappers group this month, choosing Cajun or Creole as a theme, I knew that this was what I wanted to make. Isn't that a gorgeous graphic that Kathy made for this event? Soup Saturday Swappers post on the 3rd Saturday of each month based on a theme chosen by one of the members. If you would like to join in the fun just leave a comment below and I will be happy to add you to our group. This was the most amazing dish!! I couldn't believe how wonderfully rich and comforting it was. I was concerned because Frank doesn't care for too much spice so I adjusted the measurements accordingly. It was, in our opinion, perfectly spiced and Frank loved it as much as I. Since Creole cooking has such wonderful French Influences, with those influences being very pronounced in the origin of Etouffee, I chose to pair it with the Savoie Cuvee Gastronomie. While I liked the crisp acidity of the Savoie, I think that this particular dish needed a more fruit forward wine. Perhaps a softer, more buttery white or a light red wine would have been a better match. Oh well, I still have the Rose and the Saint Amour to pair and I loved this dish enough that I can't wait to serve it again. I'll let you know how that goes. In the meantime, please enjoy the other Cajun/Creole Soups/Stews being shared today. You will find links to these recipes following mine. 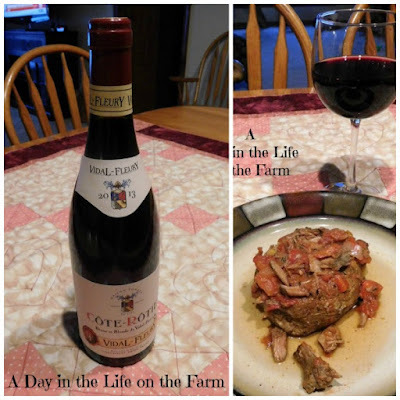 You will also find links to the other Winophile's L'Amour pairings at the bottom of this post. I hope that you and your Valentine had a wonderful celebration. I'm beginning preparation for our Chinese New Year Celebration. See my menu here. Melt the butter in a large saucepan or dutch oven over med high heat. Add the reserved shrimp shells, small diced onion, small diced rib of celery and the bay leaf. Cook and stir until shells turn pink and vegetables start to soften, about 5 minutes. Add 2 cups of chicken stock and bring to a boil, reduce heat and simmer for about 30 minutes. Strain the enhanced stock into a 4 cup measuring cup. Discard the solids. Add additional chicken stock to the enhanced stock to make 4 cups. Set aside. While stock is simmering, combine the paprika, garlic powder, thyme, oregano, black pepper, white pepper and cayenne pepper in a small bowl. Set aside. Melt 4 T. of butter over medium heat in the same saucepan used for the stock. Stir in the flour. Cook and stir constantly until the color of peanut butter, about 10 minutes. Stir in the medium onion, large rib of celery and bell pepper. Cook and stir occasionally until vegetables start to soften, about 15 minutes. Stir in half of the spice mixture and the seasoned diced tomatoes with their juices. Stir in the reserved stock, bring to a boil, reduce heat and simmer for 15-20 minutes. Jeff at Food, Wine, Click! gives us "French Wines for 'His' and 'Hers' Valentines"
David of Cooking Chat dishes up “French Wine Picks and Pairings for Valentine’s Day” and "Beef Stew with Root Vegetables and Côte-Rôtie Wine"
Liz from What’s in that Bottle pairs "Celebrate Galentine's Day with French Wines & Fondue"
Gwen at Wine Predator shares "Sweethearts: French Wines and Pizza"
Martin from ENOFYLZ Wine Blog tells us about "Celebrating L'Amour Du Vin With French Wine At The Table"
Rupal of Journeys of a Syrah Queen swirls up "Valentine's Day Romance with French Wines"
Jane at Always Ravenous asks "Why Does French Food and Wine Taste So Good? Love!" What a beautiful dish, Wendy! It sounds like you and Frank enjoyed a romantic Valentine’s Day over a nice meal and a good wine. What’s better than that? Cheers! Life is very good Lauren. Cheers. Your Shrimp Etouffee looks wonderful! The distinctive flavors of New Orleans cooking shine through....I am going to love enjoying a bowl of this soup! Enjoy it Kathy and thanks so much for hosting this month. I love Shrimp Etouffee, and now I have the recipe, thanks to you. I'll have to try this out sometime. This was a really good version Sid, if I do say so myself. I had this dish recently at a restaurant but it was served with grits. Love your dish! It would be good with grits too but hubby is not a fan. A soup I've never tried...most likely for my dislike of rice. I might have to try this using small pasta instead! You can serve it over grits, mashed potatoes or with tortillas, as well, Colleen. Several quiet romantic dinners at home! You love birds you!! P.S. This sounds delicious. Pinned to make for sure! Wendy this is brilliant. Love the tie in If love, Marie gras, delicious food and the wine. Well done. Sounds like you had a week of romantic dinners. The Shrimp Etouffee looks delicious! And you still have two bottles of wine!!!! Cheers! Shrimp is one of Julie's favorites, but I've never made Shrimp Etouffe, time to correct that mistake. Thanks for sharing Wendy! I loved it, I hope Julie does too. Yes! As a resentful vegan who can eat fish and family from New Orleans, I am all over this recipe. Thanks, Wendy! So glad you shared an étoffée recipe! I have never been but it is on my bucket list. I love shrimp and I think it's perfect in a dish like this, with these spices- love that you gave a wine pairing too! 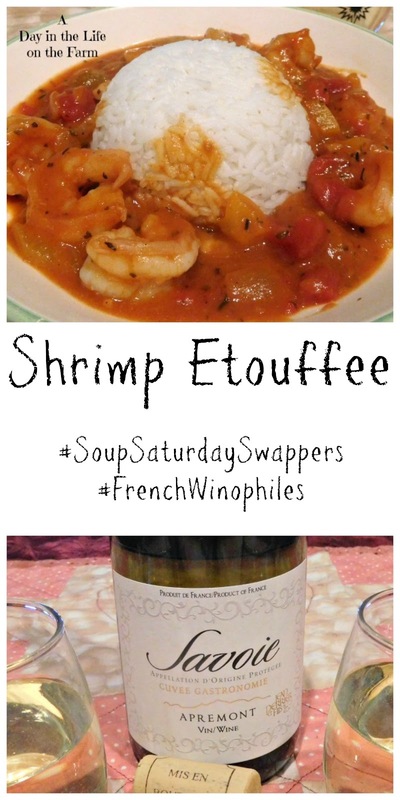 Great pairing of wine and Shrimp Etoufee, makes a perfect and compelte meal. Mmmm that Shrimp Etouffee looks amazing! Sorry it wasn't a great pairing though. And hope you're having a wonderful trip! I did have a great trip Nicole and it's not like we didn't drink the wine LOL....killed that bottle and opened another. Very nice! I always forget about making shrimp etoufee and we love it so much. Thanks for the reminder! It was my first time enjoying it but it won't be the last. Great wines! I'm grateful to Lynn also! The Etouffee is a new dish for me too. I wonder if the Loire Rosé with slight sweetness would be a good pairing? Heading over to check out your Ropa Vieja! I think it would have probably been better. If you try it let me know. Yes, shrimp etouffe is a tasty dish! I bet it would be very good with the rosé. I think that would have been a better choice David.